Does anyone else hate cleaning the shower as much as I do? I think it is one of the nastiest chores on the list of things to clean in the house. Introducing my latest investment. The Scrubbing Bubbles automatic shower cleaner. I had one of these a few years ago, but it stopped working. My thoughts are that it ceased up from being in a box and not being used. The new model comes basically assembled, you just have to attach the hanging bracket. Once you manage to find 4 AA batteries for it (which aren’t included), you can simply hang it from the shower head and let it start cleaning. The instructions recommend starting with a clean shower, but not required as they claim cleaner will eventually get your shower nice and clean over time with continuous use. After the last person showers, you press one of the two cleaning buttons (either + or ++ for more cleaning power) and it will give you about 10 seconds to leave the shower before spraying the whole thing with the cleaning solution. They say each bottle will last up to 30 days, but the refill bottles are relatively inexpensive (around $5). The only two disadvantages that I have with it are that I keep bumping into it when standing under the shower because the pressure isn’t that great from the shower head, and that it only sprays the chemicals about 18 inches below the shower head so you will still have to clean the top portion of your glass shower doors. I was thinking about putting a screw into the wall above the shower head to hang the machine higher and slightly off to the side to solve both of these problems. 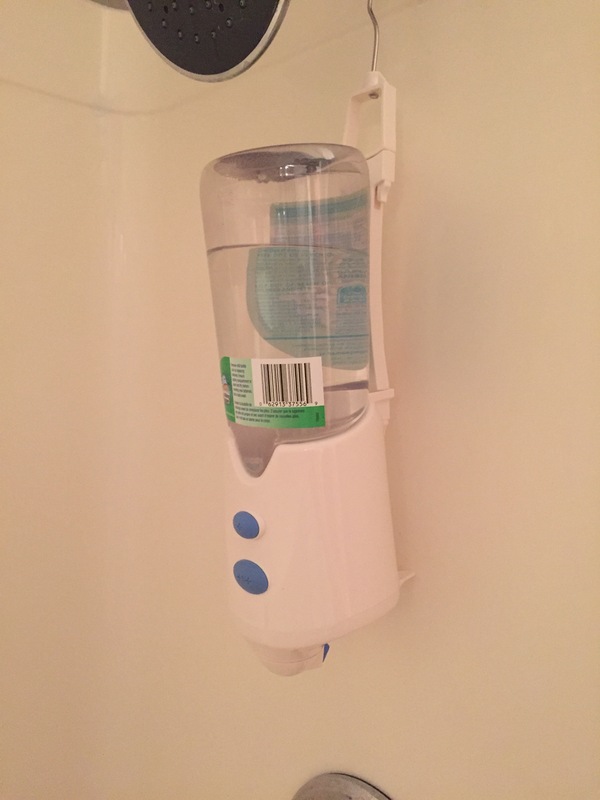 Have you used the Scrubbing Bubbles automatic shower cleaner? Did it work as promised for you? This entry was posted in Shopping & Styles and tagged cleaning, machine, Scrubbing Bubbles, shower. Bookmark the permalink.